One of the significant indications of an actor’s technique is the way in which he or she responds to playing the role of a major artist. Will there be an attempt to communicate “depth” in the conventional sense, with the implication of genius in everyday gestures and line readings? We look at the style of acting as a commentary on the meaning attached to public performance; it’s self-reflexive, in that the level of projected intensity reflects convictions about whether, and how, works of art are related to the artist’s personal experience. For example, in Love is the Devil (John Maybury, 1998), Derek Jacobi’s Francis Bacon is a visibly tense, disjointed character whose paintings are the visual outgrowth of his persona; in Jacobi’s virtuosity, there was the assumption of a direct correlation between the nature of Bacon’s experience and the fragmentation of his art. On the other hand, some actors have played intriguingly with the concept of “doing nothing,” as in Sirens (John Duigan, 1994), in which Sam Neill’s portrayal of Norman Lindsay gives no indication that the artist’s consciousness is substantially different from the other characters. Unusually, Neill’s characterisation makes no claim on knowing where Lindsay’s talent for painting mysterious nudes “comes from.” Thus the playing of genius calls attention to an actor’s attitude to performance and to the notion of “character” in general: whether identity is a matter of projection or revelation. James Lapine’s Impromptu (1990) is a film which acknowledges the fact that our sense of the inner life of an artist is inseparable from creative reputation. The movie plays with our ideas about art and creativity – it is openly speculative about the lives of its characters, and this hypothetical, buoyant narrative stands in for the mystery of how art comes into being. Sarah Kernochan’s script casually assembles George Sand, Delacroix, Liszt and Chopin for a few days in the country, and while the style is superficially high farce, the matter-of-fact labelling of genius within the film reflects a startling, original approach to the idea of character. The dialogue is filled with quotations from works and denaturalised, semi-abstract statements which relate to conventional notions of genius (Chopin is said to be “all emotion and refinement,” and is described in terms of grace notes): it’s as if we are watching these figures interact from a distance of time and historical construction, so that it is works of art rather than individual characters which are being juxtaposed and commenting on one another. Hence the concept of a coherent, unified self is seen as an imaginative conceit, one which requires the whole apparatus of farce to sustain it, in terms of matching the external identity to the character’s perceived inner life. 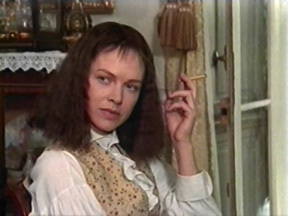 It is in this context of theoretical unity that Judy Davis plays the role of George Sand; as the legendary writer and seducer, she constructs a series of theatrical poses which suggest authorial intensity and single-mindedness, but which tend to disintegrate into small, nervous lyricisms of voice and gesture. From the moment she arrives on screen, her flexible free walk contrasting with the small “period” steps of the other characters, we are aware of the postmodern aspect of Davis’ presence; the exact, enforced rhythm of her stride indicates an identity which is superimposed onto experience rather than a naturalised part of it. As usual, she dominates the frame through her physical linearity – the defined edge of her hair, the white face scarred by a dark mouth – as well as cutting through the tone and texture of the film with a strikingly low, decisive voice. The fact that these are conscious elements of self-presentation creates a dual awareness of her performance – an actor whose fascinating preoccupation with self-definition feeds into our conception of her character, whose dramatic self-invention and lifestyle continue to seem incongruous. Lee Siegel has described the way in which an actor can allow “his persona to obtrude out of his roles the way the characters…obtruded uneasily out of life” (1) – a technique which represents the antithesis of Method acting, since the focus is on the effect of the performance in relation to mise-en-scène, rather than on “authentic” or recognisably human gestures. In this regard, Davis can be seen as an actor who finds a stylistic correspondence for her character’s situation, but within the filmic reality rather than in her own personal experience. Davis’ way of interacting with the mise-en-scène (her sharp, ahistorical movements and handling of objects) corresponds with, rather than represents, our understanding of how Sand’s presence might have been perceived at the time. But, unlike the traditional conception of Method performance, this “effect” of individuality cannot be separated from the context of the film’s reality: it has been constructed in relation to the text’s overall impact. Davis’ compressed, tense line readings and angular movements draw us into an aesthetic of imposed formalism and control. The element of artificiality is foregrounded, so that we have a sense of the constant effort of projecting the self outward; Davis’ “excessively” formal gesturing draws attention to the amount of work it takes to produce the effect of consistent character and individuality. According to James Naremore, our culture is determined by the “illusion of the unified self” – the fact that we see ourselves as “transcendent subjects of experience who express an innate personality through daily activity, ultimately becoming star players in our personal scenarios” (2). Davis’ acting draws from these kinds of post-existentialist concerns about unified identity; her work dramatises the efforts of becoming an active protagonist, to the point that any conception of “transcendent” individualism becomes didactic and uncanny. In Impromptu, her performance highlights the artificiality of striving to maintain one’s position in the eyeline; in her rigid smile and the self-consciously poised angle at which she holds her cigar, there’s a stark linearity which immediately attracts our conscious attention. James Lapine emphasises this point by framing her white face against sparse, monotonal backgrounds (the other characters tend to be flanked by pastel decor), and by shooting a number of scenes in which she clears a straight space in the room by simply striding through it – for example, at the dinner party of the Duchess D’Antan (Emma Thompson). As one reviewer noted, “she doesn’t just walk in, she blows in on a torrent of extravagant self-assurance” (3). Davis’ movements deny an organic relationship with mise-en-scène – there is a discordance between the construction of the self and experience. She makes use of the actorly technique of investing objects with expressive significance by touching them (she glides her hand over the edge of a hat, and pats walls and doors with a satisfying tap) but such “meaningfulness” is deliberately in excess of narrative function. These gestures subvert certain philosophical assumptions which relate to the spectacle of Method acting, but also the more general context of social identity. The Method concept of “revealing” selfhood through an expressive, often fetishistic, relationship with props and surroundings corresponds to the ideal of innate transcendence which Naremore describes: the illusion of an identity which is automatically expressed through daily actions, without the need for strategic self-construction. Thus, by condensing and stylising particular techniques of Method acting, Davis exposes the self as a mode of performance. The destabilising of performative codes becomes a theme in Davis’ acting, especially in relation to the conventions of film work. She uses the slightly out-turned stance which actors in film and theatre generally employ to make gestures visible to the audience; however, that pose becomes frozen and denaturalised here – it is broken up into static formations, as if the process of naturalising the spectator’s point of view has somehow gone wrong. During Sand’s first attempt to seduce Chopin (Hugh Grant), Davis performs a series of odd, frontal poses – she extends her arms symmetrically on either side and tilts her knees several times, but always with her figure held obliquely towards the camera. There is an ironic contrast between the theatrical pose which connotes visibility of gesture, and the gestures themselves, which are inscrutable and idiosyncratically formal. Just as film actors often work “from ludicrous positions” in order to “look perfectly natural to the camera” (4), Davis’ manoeuvres draw attention to the inherent theatricality of “doing nothing” for the camera. Her gestural choreography reads like the notations of a performance, in which expressive coherence is implied but always deferred. The elegance and dexterity of her movements suggests a rhetorical formation of the self – the connotation of theory is appropriate for the character of a woman who takes on the outlines of male dress, and is in love with the idea of making art and seducing genius. But what’s interesting is that it is the economy of Davis’ presence which indicates an excess of meaning – the “excess” of style does not reflect a loss of control but rather the consciousness of it. By denying the naturalness of “revealing” or readable gestures, Davis makes us question what theatrical excess is, and its part in daily life. For Kristin Thompson, excess consists of a “perceptual play” in which we are invited “to linger over devices longer than their structured function would seem to warrant”. (5) Davis’ game, then, consists of playing with the perception of depth in representation – her elaborate poses and structured line readings are a way of deferring meaning at the surface of style. Davis imposes a decided rhythm on her line readings, following the logic of her own intonation to the point where it overrides the content of language. Lee Siegel maintains that, since Jack Nicholson, “no one…has detached words from their contexts as startlingly” (6) as Kevin Spacey, but I think Judy Davis has a reasonable claim on this trademark of rhythmic, decontextualised spacing between words and phrases. Her insertion of precise, non-diegetically motivated pauses into lines (Liszt is well-known, she says, “because of his…teeth”) builds into an autonomous rhythm of speech: that final “teeth” is pronounced so cleanly and decisively that we forget our expectations of meaningfulness, and become caught up in the pleasure of the way in which individual sounds interact – in the grainy surface textures of consonants and language. Like Nicholson and Spacey, Davis has a habit of reading her lines as “given” – drawing attention to the fact that they are lines, and that she has been waiting to say them for some time. “You’re a menace to the future of art” is spoken very rapidly, in reference to the kind of impossible, ahistorical statement it is – but Davis throws away any conventional meaning the phrase might have by speaking it in a matter-of-fact way, stressing only the hardness in her utterance of the word “art.” Similarly, “epithets” and criticisms are delivered in a deliberately flat, impassive tone (“The style’s a bit precious…mind if I rewrite it?”); French words are Anglicised and made brittle without any attempt to emulate Sand’s voice. Thus the production of meaning through suggestive pauses and intonation is partially ironised. When Mallefille (Georges Corroface) complains, “You promised to love me…” Sand’s “witty” reply (“Ah, but I didn’t promise to succeed”) comes without a pause, or any implication of needing to think of a response – there is no pretence of spontaneity here. Instead, our attention is directed towards the specific choices she makes regarding the emphasis and intonation of a given line. Davis foregrounds verbal experimentation and play in her readings – we have the sense of the lines being considered and “tasted” even as she utters them. The fact that she often keeps us waiting before finishing a phrase causes us to become absorbed into her creative decision-making, since there is the feeling that she may be improvising her reading at that moment. Through the focus of anticipation, Davis’ vocal performance emphasises the present moment – meaning is continuously deferred as lines and rhythms are stretched out beyond their apparent diegetic function. A major theme in Impromptu concerns the concept of authenticity in reading, and the “definitive” reading of a line, whether in music or language. The proof of authorship of a love letter written to Chopin hinges on Sand’s ability to deliver a “sincere,” passionate reading of the part which ends, “But I love strongly, exclusively, steadfastly…” Davis lowers her voice and dramatically angles her gaze to signal “intensity” here, so that the ability to express “truthful” emotion is conceived of in terms of actorly skill rather than emotional correspondence. James Naremore writes that, in our daily efforts to maintain “expressive coherence, we are all actors…Even when our presentation is utterly sincere, we remain actors because the expression of “true” feeling is itself a conditioned behaviour” (7). Davis’ acting gives the impression of a personality which becomes strained and didactic in its efforts to retain external coherence. The character visibly resorts to “direct” gestures such as raising the eyebrows and intensifying the gaze in order to suggest a unified identity. We can compare her style with that of, say, Anthony Hopkins – an actor whose performances, while psychologically intense, tend to ignore the paradox between characters who supposedly have trouble expressing themselves and his very precise, consistently intelligible acting. Hopkins’ characters in Howard’s End (James Ivory, 1991) and The Remains of the Day (James Ivory, 1993) have “inarticulate” emotions which somehow reveal themselves directly and plausibly through behaviour. However, Judy Davis’ acting here exposes the difficulty and strangeness of matching one’s expression to an internalised, inarticulate conviction, particularly in the scenes where Sand has to express love and truth of emotion. In the scene where Sand declares her love for Chopin, she looks at him and rapidly turns away several times, in each case putting on a different expression of nervousness or intensity, like someone who has to go through a range of masks in order to find the one which communicates intelligible feeling – and does not always get it right. I mention Impromptu more than any Davis movie because it seems to me the one film that’s been passionately interested in exploring the possibilities of her presence. In Barton Fink (Joel Coen, 1991), Davis was able to work some fascinating, wine-dark inflections into her Southern drawl, until her character was offed. Husbands and Wives (Woody Allen, 1992) showed Davis’ confidence disintegrating into tiny, tense mannerisms and her focus drew us in, but it was in the context of a limited, neurotic character, and conspicuously a “character part.” In The Ref (Ted Demme, 1994) she was parodied by Kevin Spacey, of all people – the two are uncannily similar in their dark, low-voiced contempt. But in Impromptu her authorial intensity fills the film, and is vital to it: her dramatic self-presentation feeds into the film’s radical notions of artistic reputation. In Impromptu, emotional directness is implied by Davis’ stylistic self-awareness – for example, the authority with which she touches and defines the objects around her. In an early scene in the publisher’s office, Davis taps the door smartly after closing it, and slaps her hand on the manuscript as she places it on the table. In a later scene, Lapine photographs her striding into a room and dropping tightly wrapped packages which fall with a sharp sound on the desk, saying, “This is the novel, and that’s the last chapter of the memoir.” The ability to define objects through contact is a source of power, and this is often connected to the character’s process of writing and being able to script other people’s reactions to her. Davis suggests Sand’s command over her former lovers, Mallefille and Alfred de Musset (Mandy Patinkin), by placing her small hands firmly on their backs and shoulders while she speaks to them. The soundtrack highlights her clicky walk and habit of tapping smooth surfaces with her hands – Lapine emphasises these quick, clean sounds which correspond to her voice and movements, giving us a sense of precision and positive direction in relation to her presence. We associate her energy with the pistol shot she fires at the wounded horse, and the effortless way in which she “skateboards” out from underneath Chopin’s piano the first time they meet. These demonstrations of authority are often elegantly pointed and cruel. In the salon of the frequently pregnant Marie d’Agoult (Bernadette Peters) who has recently given birth, Sand marches over, sits down and asks, “Was it a difficult labour?”, casually swinging one trousered leg over the other. David Thomson writes that, “To act is to enjoy power,” to be “stimulated by the prospect of authority” (8), and we certainly have that feeling with Davis as she sits in an armchair and curls her dark lip, contemplating pitiably lovestruck wives and ineffectual men. As in Husbands and Wives, where her Sally thinks of dividing the world into foxes and hedgehogs while making love, there is the fascinating idea of a character whose conscious application of theory to experience works within the film, implying her authorial intervention in the script. The focus on Sand’s novel-writing, her distribution of letters, and her meticulous construction of plays and seduction scenes suggests that the character’s involvement in creating situations overlaps with the direction of the film itself. Thus Davis’ physical self-assurance appears to be supported by an uncanny, external knowledge of the text; at the dinner table of the D’Antans, she behaves like an author who reacts to the other players’ scripted lines with vague, polite interest. The cult of artistic celebrity in both literature and cinema is reflected in Davis’ open enjoyment of being able to control space and time through her acting. The film tests this ability by drawing attention to the way in which her star identity persists even as her acted image disintegrates. Lapine often positions Davis at the edge of the frame, and then keeps the camera moving, so that at times only half of her face is visible to us, as in the scene where she watches Delacroix (Ralph Brown) at work, or when she has the final encounter with her mother (Anna Massey). Occasionally, her features disappear from view altogether: when she talks to the men who have assisted Chopin after his duel with De Musset, the camera pans away from her and towards the people she is speaking to, leaving only an elbow and a sliver of pale face to signify identity. But everyone else in the frame is staring incredulously at those fragments of being and the source of that commanding voice, and so our gaze moves along in that direction, to the far right of the screen. In Davis, Lapine is able to create the illusion of something which exists at the limits of representation, of being only just captured on screen, before that energy breaks up into fragments of eye, hair, jutting limbs. We’re always in the position of having to shift our attention in order to identify with her jagged movements and dislocated position, redirecting our gaze towards the periphery of the frame. That ability to induce the audience to focus on the margins of the screen comes across as a political act, a way of playing with power so that what appears to be peripheral becomes the centre of the eyeline. In this way, Lapine’s visual style reinforces the film’s theme of the historical construction of character, since images which initially seem radical or marginal become naturalised through fluid camera movements. In a scene towards the end of the film, when Marie goes to confront Chopin at his house, she says of Sand, “One way or another, Franz knows exactly who she is…” A low voice responds, “I’ve always wanted to know” – and there’s a brief pause before we cut to Davis slouching at the edge of the screen. The combination of the editing and Davis’ use of mise-en-scène makes the margin of the frame seem like a concrete thing, which can be leaned against – this resembles the postmodernist technique of re-defining the conventions of representation by drawing attention to them. The film’s showcasing of Judy Davis and the process of discovering “who she is” celebrates the seductiveness of star personae, but it also exposes the extent to which such projections are determined by a fetishistic appropriation of fragmented imagery. Lapine subtly plays with and fragments Davis’ moving image – the film encourages our construction of an expressive identity which persists even as the image moves into shadows and dark recesses, or becomes reduced to an elbow onscreen. These disintegrations and reconstructions of identity relate to Davis’ often-stated ideal of “playing ‘characterless characters'” (9), which I think here refers to both a loss of selfhood on Sand’s part, and a performance which comments on the theatrical nature of character. Davis’ creation of a postmodern, “synthetic” persona out of quoted lines and theatrical gestures suggests a mimicking of the edited construction of identity on film and in life. The episode in which Sand, Liszt, Chopin and Delacroix put on a play for the D’Antans illustrates how the idea of performance is conceived of within the film. We see Davis working in the context of collaborating artists, all of whom are wearing masks or in some way consciously incarnating the idea of genius, as when Liszt (Julian Sands) announces, deadpan, “I am…God.” These rehearsal and “acting” sequences do give off the very exciting sense of having been improvised – we see a succession of frames which are decentred by chaotic, individual movement. The conception of theatrical improvisation here is reminiscent of Renoir – for example, art “happens” when Chopin’s back accidentally leans against the piano and strikes a series of chords, revealing the fact that the present moment is already a shaped experience, inseparable from memory. In this context, each glance or movement between the characters represents a particular convergence of narratives – for example, the idea of Chopin looking at Delacroix has narrative implications in terms of historical construction. Watching the actors assembling their own sets and scripts, and seeing the responses of the surrogate audience within the film, creates the sense of a world in which the idea of performance and presentation is built into every aspect of experience. 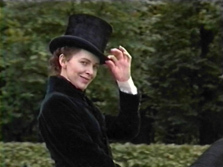 Yet even amongst all these self-conscious actors, Judy Davis comes across as a mask – the other characters wave props and put on costumes which seem to alter their identities, but with Davis, the disguise merely adds another layer of artifice to her presence. This is an actor whose best-known identity is a mask – with her signature dark lips and pale skin, Davis’ main expressive feature is clearly drawn, almost imprinted onto her face. It’s extraordinary to think of her carrying this consistently opaque face into different filmic realities. At one level, her appearance seems to comment on the extent to which self-presentation and self-stated genius is simply adopted by the world – the ability of a pre-formed personality to impose its will on unselfconscious others. Lapine has said that he cast her in the film because “she’s incredibly unique and makes no effort to be anything but who she is” (10), but rather than suggesting the primacy of selfhood, I think this actually indicates an insistence on emotional incoherence on Davis’ part, an unwillingness to participate in the fiction of plausible character. It is in resistance to the idea of character that her persona is marked by absence and abstraction. One is reminded of her impassive expression during the strip scene in High Tide (Gillian Armstrong, 1987), in which she removes layer after layer of clothing on stage only to reveal a body which is still opaque, still unyielding. If, as James Naremore suggests, our enjoyment of movies often “derives from our feeling that the actor is doing something remarkable” (11), then that involvement is influenced by our perception of the effects of enaction on the performer herself. Davis’ use of repeated, outlandish gestures is intriguing both in terms of the strangeness of what we are witnessing, and our conception of what the actor must be feeling. For Sand’s writing scenes in Impromptu, Davis grasps her quill fiercely and compresses her head with one hand, as if trying to force the words into existence. Davis is not attempting to communicate genius in a conventional way, but it doesn’t come across as a parody of the creative process either. So what is the effect of this? I think that Davis’ exaggerated, systematic gestures are a way of constructing a link between the character’s behaviour and the effect of acting on the actor. In Deconstructing Harry (Woody Allen, 1997), Davis bursts into Woody Allen’s house and begins signalling “distress” by throwing out her arms in a series of odd, perfectly angular poses. Whether a person in her situation would really move in this particular way is irrelevant; the actor, along with the character, is not attempting to express feelings, but rather discover them through enforced repetition. In Davis’ acting, we witness the seemingly postmodern technique of discovering emotion through the repetition of gesture rather than vice versa. This is an actor/character who finds neurosis through programmatic movement, so that the performance of learned behaviour teaches her what to feel, allows her to undergo a certain ritual expression of emotion. Davis emphasises the artificiality, the strategic element, of this process, and therefore undermines the assumption of a distinction between lived emotion and theatrical gesture. This is, I think, the most radical aspect of her work – the fact that she is able to create a persona which switches between the extremes of impassive “characterlessness” and theatrical decadence. But while Allen’s films tend to marginalise Davis’ theorising as eccentric, Lapine’s work with her in Impromptu makes stunning use of her tendencies towards insouciance and abstraction. Davis’ construction of character clearly interacts with the film’s themes of authorial control and self-invention, but Lapine also finds a visual style which makes a fruitful bond with the actor’s technique. The fluid, continuously moving camera allows her image to shift in and out of focus seemingly without effort; we are conscious of our projection of intensity onto the fragments of her image, yet it doesn’t interfere with the overall rhythm and visual grace of the film. And Davis’ own jutting, angular movements match up with the camera’s insistence on positioning her at the edge of the frame and dislocating our gaze towards her – it’s as if, in the end, a character’s self-image could determine the way in which she will be portrayed. Lee Siegel is describing Jack Nicholson in “The New King of Irony,” Talk, 1.7 (2000), p. 158. James Naremore, Acting in the Cinema (Los Angeles: University of California Press, 1988), p. 5. Hal Hinson, “Impromptu,” Washington Post, May 3, 1991, p. B1. Naremore, Acting in the Cinema, p. 40. Kristin Thompson, “The Concept of Cinematic Excess,” in Philip Rosen (ed. ), Narrative, Apparatus, Ideology (New York: Columbia University Press, 1986), p. 133. Siegel, “The New King of Irony,” p. 158. Naremore, Acting in the Cinema, p. 69. David Thomson, “Our Lord of Danger,” Film Comment, 19.2 (1983), p. 29. Leslie Felperin, “Ms Tough,” Sight and Sound, 9.6 (1999), p. 11. John Clark, “Punchin’ Judy,” Los Angeles Times, April 27 1997, Calendar Section, p. 3. Naremore, Acting in the Cinema, p. 26.